Geli Korzhev was born in Moscow in 1925 and has studied at the Surikov Institute in Moscow from 1944 to 1950, graduating from the studio of Sergei Gerasimov. When Stalin died in 1953, the legacy of his rule was called into question. At the twentieth Party Congress of 1956 Krushchev delivered his famous speech denouncing Stalin. The new leader perceived the need to break with the violence of Stalin’s rule and to pursue a more liberal politics. After 1953 Kruschev’s ‘Thaw’ gave artists more freedom to pursue their own personal styles. 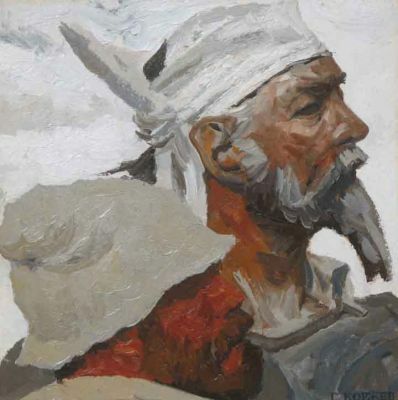 In contrast to the previous idealisation and romanticism, artists began to paint more objective visions of Soviet life, prompting the rise of what has become known as the “Severe Style” and Geli Korzhev was one of the founders of that movement. This mode of painting tended towards a chiselled, minimalist execution, as opposed to the detailed realism which had dominated the 1940s and 50s. His latest work “Don Quixote’s Doubt” (1994) as well as the earliest “Homer” (1958-1960) above is a perfect example of the “Severe Style”.